There are a variety of cost-saving strategies which you can apply when planning your trip. Some of these will seem contradictory: Book early Vs. Use last-minute special offers. The most important thing to remember is to aim to maximize the amount of value you gain from the money you spend on your vacation given your individual family, professional, and financial circumstances. Some tips, such as booking a last-minute trip, just may not work for you. You may find that a strategy such as renting accommodation directly from the owner of a vacation property may be a method which works over many trips for you. Above all else, flexibility is key. Watch out for last-minute special offers on online booking engines (Expedia, Orbitz, etc), meta-search engines (FareCast, Kayak) and airline websites. Use low-cost airlines such as Southwest Airlines or JetBlue (www.jetblue.com). Rent accommodation directly from owners. Vacation Rental By Owner (www.vrbo.com) and OwnerDirect (www.ownerdirect.com) are good places to start to find such properties. Maximize your frequent flier membership. Go to destinations during off-peak seasons such as visiting ski resorts in summer. Take your chances with the weather. Most people avoid high desert temperatures mid-summer. Prices at accommodations are consequently lower during these months. If you’re planning a relaxing time by a pool, this could be a good choice for you. When children spend all day playing in water, they are less likely to notice the heat anyway. Use packages. Per-person or per-night rates can be much lower than advertised prices when flights and accommodation are bundled together. Use discount websites like Priceline (www.priceline.com) or Hotwire (www.hotwire.com). I recently used Hotwire to book a room at a four-star hotel in central London for 55% less than the advertised price. Keep in mind that you don’t find out the actual name of the rental car company or hotel with whom you have booked until after you have paid. If you can, use the shoulder seasons: particularly April-May and September-October. 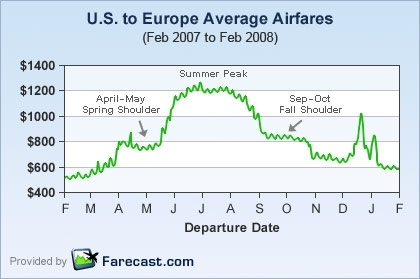 During these months airfares between the U.S. and Europe can drop be up to 30% lower than during peak travel months. This entry was posted in Advice And Resources and tagged Budgeting on August 7, 2008 by wandermom.